My favorite place to practice yoga is at home. Don’t get me wrong. I LOVE going to classes in a studio, but it is just not feasible most of the time. Travel time alone can stretch a 60 minute practice into taking 2 hours or more. When I go to my favorite studio, which is 45 minutes away, for a 90 minute class I’m gone for a good 4 hours. As a busy homeschooling mom I can only make that happen once or twice a month. But the benefits of doing yoga come from persistent practice day in and day out. To really reap those benefits you have to do it at home. That’s the only way it can weave itself into becoming a part of your everyday life. A body. I know you’ve got one of those. Floor space. I bet you have just the right amount at the side of your bed to do a child’s pose, a few rounds of cat-cow, a lunge on each side, and a downward facing dog. If you’re practicing without a mat you’ll need a carpeted place that’s at least 3′ x 7′ or so. Your living room probably has more than that. A yoga mat. Though you can practice without a mat, having one makes it so much better. Look for something grippy and relatively thin. If your floor space is carpeted you’ll want your mat primarily to keep your hands and feet from sliding away from you while holding poses. If you have a solid surface to practice on, like a wood floor, you may want a little cushion, but beware thick squishy mats! Anything foamy and thicker than 1/4″ will be shifty and hard, even dangerous, to balance on. You want to find a mat that is dense and firm. There is a big price range. 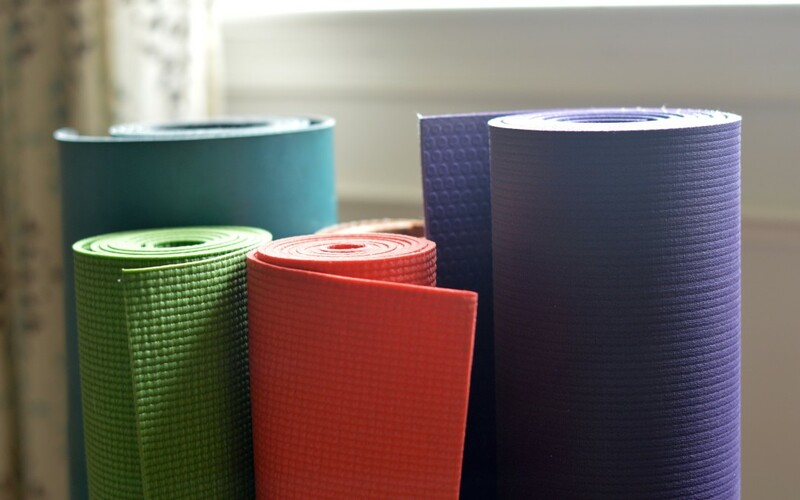 I used a $10 Gaiam mat from Target for 5 years and liked it just fine. 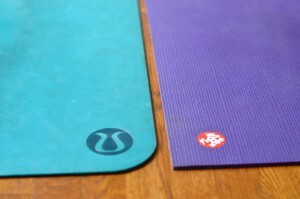 Then I decided to upgrade and got The Mat by Lululemon. It was definitely an upgrade. It was thick and firm with a smooth, yet sticky top layer. I think the top surface is made out of the same stuff they wrap tennis racket handles in. It gets stickier as you get sweatier, but it really shows dirt, water marks, and grease marks. I now use a Manduka Pro every day. I love it. My yoga room has a wood floor and this thick, heavy mat is the perfect combination of grip and cushion. Its heavy weight makes it stay put without sliding or shifting as I move through poses. I have been using it for almost 3 years and it still looks new. A blanket. 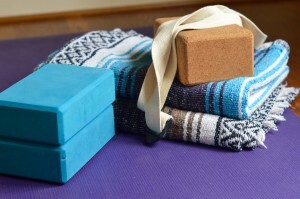 A densely woven blanket, a cotton quilt, or even a beach towel to fold up and sit on is high on my priority list for yoga gear. Most bodies need a lift under the sitting bones (the boney points of your bum) to keep the spine erect and to get the pelvis in a forward tilt ready to fold forward without over stretching the lower back. Blankets are also helpful for rolling up and using as a bolster to lay on or a rolled support for heels in a squat. I have stack of these handwoven Mexican blankets, but you probably have a twin size quilt or big beach towel that will work just as well. Blocks. Sometimes you need the floor to be up just a bit higher. It is important to make every pose fit the body you have today and not force it into a pose that doesn’t fit. That is where a block comes in. Yoga blocks can also be used to sit on, lay on, squeeze, and balance on. They are simple, inexpensive tools that have a myriad of uses. I have a few foam blocks that were just $5 each. They come in a few different sizes and you can find them in foam, wood, and cork. I have both foam and cork and prefer the dense foam ones. It is nice to have a pair, but one is enough. You can always use a stack of books or a can of veggies instead if you really need to. Strap. Just like a block can bring the floor closer to you, a strap can make that far away foot possible to reach. I call them “Go-Go Gadget Arm Extenders.” A belt, tie, or a hand towel can usually work, but sometimes a big adjustable loop is what is called for. That’s when a yoga strap, which is basically a long length of webbing with a buckle, is nice to have. A bolster. 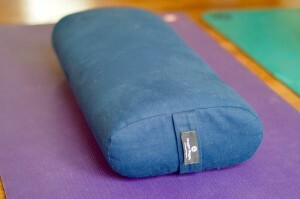 A yoga bolster is a really densely stuffed pillow. They are used for restorative and relaxing poses. Laying back on the support of one can feel like a little slice of heaven. You can also roll up 2 or 3 blankets for the same function. I have a Hugger-Mugger bolster that I love, but probably don’t use enough. A meditation cushion. I actually use my Hugger-Mugger meditation cushion every day. It is filled with buckwheat hulls, so it conforms to your bum for perfect support while sitting with a tall straight spine. I sit on mine while I read my scriptures and meditate every morning, so for me it is pretty essential, even though I have it here at the end of the luxuries list. If you are committed to a daily meditation practice I would highly recommend a cushion. A folded blanket or a block can act as a substitute. There are other things out there marketed for yoga, but the above list is what I use and recommend. You always get the most out of something when you have the right tools on hand, but even if all you bring to your practice is yourself I promise you will feel better when you’re finished than you did when you started. I can’t begin to catalog all the benefits I personally have reaped from my daily yoga practice. I get on my mat 5-6 days a week and feel like I learn something new every time. Yoga has given me a connection to my body that was elusive to me before. It fills me with gratitude for limbs and breath and helps me experience parts I didn’t know I had. I’m excited for you to practice regularly too and hope I get to be a part of your journey! The divine light in me honors the divine light in you. Namaste.